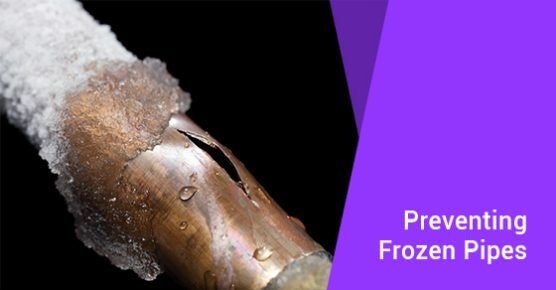 When your pipes freeze, they are at risk of bursting. Essentially, water pipes don’t expand as water does when it freezes. The expansion puts pressure on the pipes and then causes them to burst. Even a small crack can cause 250 gallons of water to drain throughout the day. The good news is that you can prevent your pipes from freezing, and avoid unnecessary plumbing services, by keeping them warm throughout the winter months. The water in the hose will freeze and expand if you leave your water hoses connected. The result is that your connecting faucets and pipes will also do the same. Another way to prevent your water pipes from freezing is to wrap any exposed pipes up with heater tapes to keep them warm. However, it is imperative that you choose your tape wisely and read the manufacturer’s instructions carefully — some tapes can overheat. Other tapes should not have insulation placed over them; otherwise they can catch on fire. When choosing a tape, the key is to choose an UL-endorsed tape that has a built-in thermostat. And, again, always read the safety instructions carefully. Your thermostat should also be set at around 55 degrees during the winter (and no lower) to prevent freezing in your pipes. Heating during the winter can be costly, but not as costly and stressful as paying for repairs you could have avoided (while also staying warm). You can install specific heating cables through most professionals who handle plumbing services. These will run alongside pipes that might be at threat of freezing and keep them warm enough to avoid the problem altogether. This is a surefire way to make sure you don’t have issues in the future. This is more expensive than heating tape, but also extremely effective. This isn’t an option for those staying in their homes, but if you leave your home for the winter, you can simply turn off your water. If there isn’t water in the pipes, then you don’t need to worry about expansion as it freezes. If you are in need of professional plumbing services, call Advanced Plumbing at 877-286-8044 or contact us online here. We’re the plumbing experts. Advanced Plumbing offers efficient plumbing services and solutions, upfront pricing and 99.9% customer satisfaction.